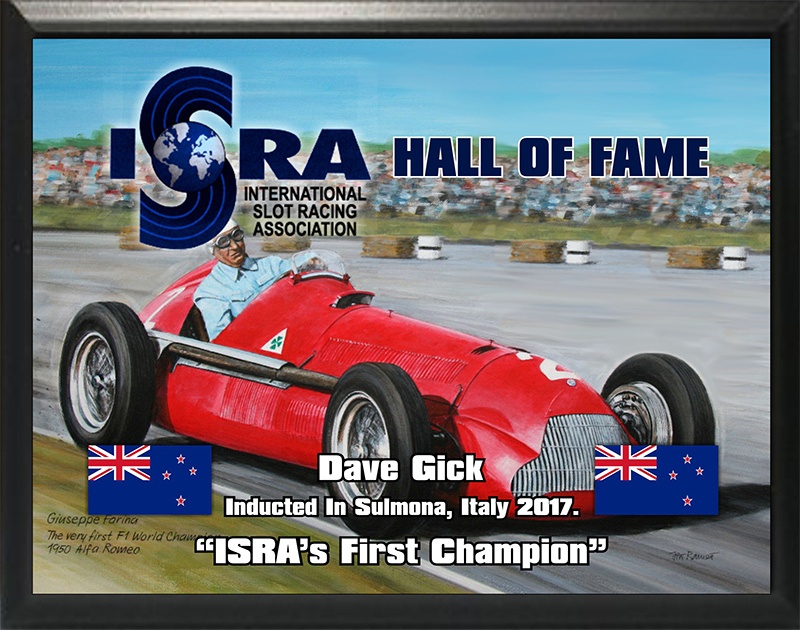 Dave Gick from New Zealand is ISRA’s first Champion, and was inducted into the Hall of Fame in the first induction ceremony in Sulmona Italy in 2017. Dave’s ISRA record is one of the most impressive in ISRA history, attending only 4 years of racing (1992,1993,1994,2002) with 18 race starts racking up an impressive 13 podiums and an incredible 8 wins in that time. Dave Gick hails from Auckland, New Zealand and is a life member member of the country’s oldest club (still existing today), established in 1962, The Henderson Minature Motor Racing Club. Dave started racing from a very early age in the junior section of the club and his father was a founding member of the club. Over the years Dave at the Henderson Club, winning championships in the Junior, intermediate and finally the Senior sections of the club, and went on to race at National Level at the New Zealand Slot Car Association championships, winning multiple championships and titles through the years. On the administration side Dave was involved in the running the Henderson club for many years, and moved on to lead NZSCA for a number of years. With the 1992 race a new era in slot racing was ushered in, with what had been a European Championship suddenly opened up to racers from other parts of the world, and Dave arrived in Ceska Lipa in the Czech Republic with a strong New Zealand team. New Zealand by 1992 was no stranger to international competition, with Chris Radisich opening the door to international competition in IMCA in Chicago in 1988, followed by both Chris and Dave attending the 1989 IMCA races, where Dave quickly established himself as one of the top drivers winning races in his first visit overseas. Dave continued to race at IMCA events over the next few years, but with the new race formats being introduced for 1992, and with Dave a strong follower of British slotcar racing (he typically raced 101 chassis and equipment) he decided to make the trip to the Czech Republic to take on the worlds best. With 5 events at that first race, Dave won 3, and was 2nd in the teams race and 16th in ES32F1, giving him the overall victory for the 1992 event, becoming the first ever ISRA World Champion. Dave retired from slot racing to concentrate on his growing business in New Zealand, and was not seen again in ISRA competition until the 2002 event in San Francisco where he came out of retirement to finish 4th in the Production Teams race, then leading ES32 had his motor fall out, but it was in ES24 that year that Dave stunned the slotcar world once again by starting on the difficult black lane and leading the race the whole way from start to finish to add to his number of ISRA wins. An impressive feat after so long in retirement. After 2002 Dave once again retired from slot car racing, and has not been seen in competition since. His printing business in New Zealand has flourished over the years and today is one of the highest quality print shops in New Zealand. Once retiring from slotcar racing Dave also had a career in full size Motorsport in New Zealand, racing Midget cars on dirt mainly at the world famous Western Springs Speedway in Auckland, but also all over New Zealand for a number of years, culminating with a best of third in the New Zealand Championships.